This is part of a series of posts that I will be writing every Thursday during the month of August about my continuing journey to start a profitable online business (read Part 1 here). It will include lessons learned, mistakes made, milestones hit and advice I can give along the way. One year ago Saturday, this journey began. At the time of my layoff, I was a well-seasoned digital marketer. My professional experience on Facebook dated back to 2007. Yet… Creating a Facebook Page was not the first thing I did when I started building my personal brand. I finally — reluctantly — created my Facebook Page on November 4, 2011. At that time, it was in my name. I’d eventually add “Digital” to differentiate it from my personal account (it was confusing for me, and was likely for others as well). That day started the true test to determine whether I really knew as much about Facebook marketing as I claimed. While challenging, it kept me on my toes and helped me become more knowledgable in the process. To be a teacher, you must actually walk in the shoes of the students. And I certainly do that. I just went back to read the first few weeks of my Timeline. It kinda made me sad. There is so much that is sad about this. I ask people to share their Twitter handles. No one responds. No one even clicks “Like.” And only 34 people even saw the post. The next day, I created this Thank You video when I reached 65 Likes (65!!). I can’t even open the video. Only 30 people saw it. No one commented or liked what was a “sincere” video message that took quite a bit of effort and courage. Just… sad. I shared 38 posts in the month of November to my Facebook Page. A total of 26 didn’t receive a single comment or like. My point? I know it’s hard in the beginning. I talked to myself a lot. You need to have a “no fear” approach. Don’t worry about embarrassing yourself. You’re basically naked. It’s okay. Just keep at it. Keep talking to yourself, and eventually others will join in! First, ask them. Ask what’s on their mind. Ask what questions they have. Ask where they’re from, when they are on Facebook, what they like and what they don’t like. I’ve been using Facebook Questions a lot this month for this very purpose. Second, put yourself in their shoes. Will they think what you’re posting is interesting? If not, don’t share it. Do something else. Take a different approach. I often see people and brands broadcasting garbage that no one will care about and they wonder why it’s ineffective. See your audience as people instead of dollar signs and let them lead the way. This has been core to my personal brand from the beginning. My first welcome tab was a graphic that featured the words “Honesty, Transparency and Authenticity.” It also had a picture of a ninja with a line through it. I hate traditional, accepted forms of marketing. Much of it feels cold, forced and inauthentic. If it doesn’t feel right, don’t do it. Don’t sell out because you’re told it’s what you need to do. To be truly successful with anything, it has to be natural. Don’t be afraid to show your true self, showcasing your values and beliefs. Let this be the starting point of your personal brand. I look back at some of the cost cutting I did in the beginning, and I just shake my head. I used a free WordPress theme with a logo I designed, and it looked pathetic. 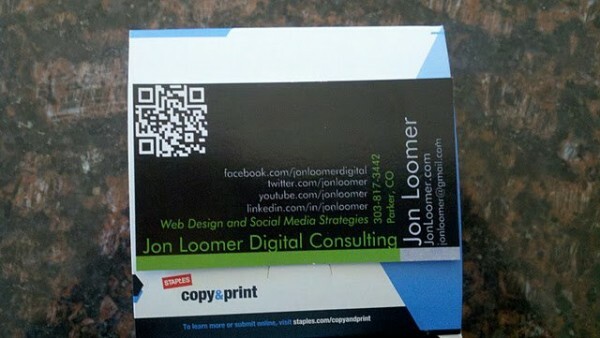 I had black and green business cards that I had designed in two hours at an OfficeMax. My Facebook Page profile photo looked like it had been through the wash three times. I was budget conscious, and I still am today. But I’ve learned that there are times to cut corners and there are times to do it right. When it comes to branding yourself, do it right. That could mean buying a premium WordPress theme or having someone else design your logo and business cards. But it also means getting a photographer to take some professional head shots and getting design help for your cover photo and Facebook tabs. If you want to be taken seriously, you need to make a good first impression. I finally figured that out. There are times that could have been very easy to call it quits. But I didn’t. I had a vision, a strategy and a goal, and I kept fighting. Don’t quit. But to keep from getting frustrated, distract yourself with a strategy. Know what you’re going to post and when. Know what your tone will be. Know how you’re going to engage your imaginary audience. And please… celebrate the little victories! Set reachable goals, and make a big deal of it when you reach them. Write on your white board a number of Likes you want to reach, and circle it. Every day, track your progress. When you hit that 100 or 150 or 500 fans, celebrate with them! You need to have a routine, but you also need to make sure you’re always doing what is necessary to make your Page as great as it can be. Check your tabs… Do they work? Are they still relevant? Are there other tabs that you could create? Should you feature something else? Check your Insights… Is your content effective? Should you change course? Read, read, read… Get out of your world. What are others doing? What is the latest news in Facebook marketing or in your field? Is there something else you should try? Stay ahead of the curve. Stay focused and disciplined… Don’t lose your motivation or your purpose. You can’t get too comfortable. To be successful, you need to blaze trails, not follow them. To do that, stay curious, aware and eager to innovate. I referred to one way you should keep your checkbook open with putting on a good face, but another is with Facebook ads. 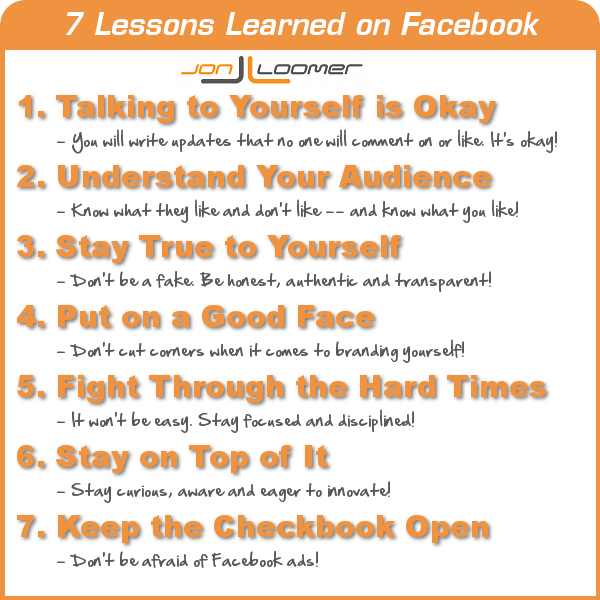 There has been no more valuable tool to my growth and success on Facebook than Facebook ads. I know. There are other well known marketers who have you convinced that buying Facebook ads is as good as burning your money. But I’m telling you… I am proof of their value. I don’t spend much — maybe $50 per month. And I don’t only use them to drive new Likes. I use ads to strategically bump content that leads to business goals. I use ads to not only better engage my current fans but create viral content that will reach new ones. Don’t be scared of Facebook ads. You can make an impact with a very small budget. What other lessons would you add to the list?